Malamute puppies have moved into the house temporarily. Five little balls of fur. Two girls and three boys. One of the boys will be inside for quite a while. His leg was accidentally injured pretty badly by his mom Solo and the future of that leg is up in the air at the moment. The good news is that the antibiotics have kept infection at bay and he is finding a way to move around and even rough house with his sibling. These little creatures have teeth now and so have been introduced to food. Nice soft puppy gruel flavored with formula. Here’s a pic of them before feeding. The puppy pile. Two red and three grey Mals. Learning to eat is a process in puppyhood. Sucking on a boobie is instinct. Put a finger into a nursing puppy’s mouth and you will be surprised by the suction. I almost received a chin hickie the other night when I picked up one of the reds and she latched onto my chin with force! The transition from sucking to chewing isn’t as smooth. It’s a bit of a free for all! These puppies have given a whole new meaning to the idea of eating. It seems to be a full body sport! I have a tub of warm water and a wash cloth standing by to bathe them afterward – I refuse to lick them clean like mama would!! 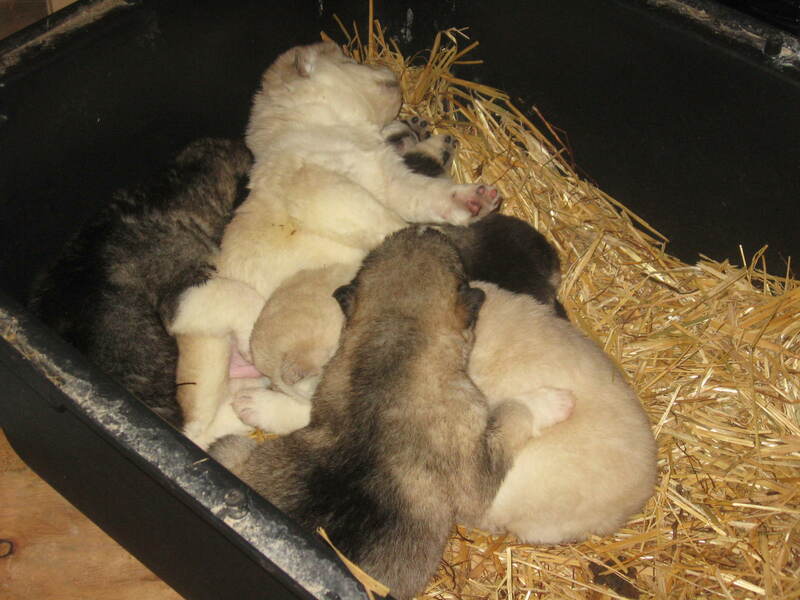 And finally if you think you can ignore a hungry Malamute puppy….think again!! This is the quiet level. They are more than capable of taking it up several notches and making your ears bleed!! This entry was posted in Uncategorized and tagged Alaskan, feeding puppies, malamutes, puppies. Bookmark the permalink. 1 Response to Awwww…they are so cute!